Ali Mushaima finally halts his hunger strike on day 44. 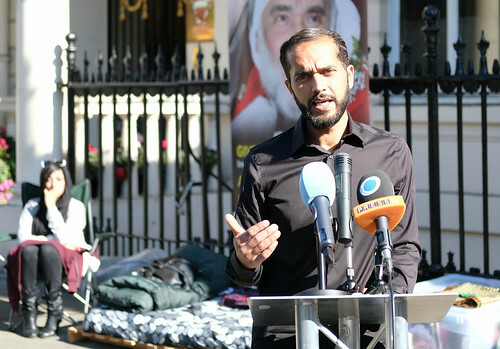 At 3 pm on Thursday 13 September 2018 Ali Mushaima held a press conference in front of his makeshift bed on the pavement outside Bahrain's embassy in London. He spoke to several overseas TV and media outlets, telling them that while he was going to continue his solidarity protest for his father, a political prisoner in Bahrain, with a liquid only diet, he was halting his hunger strike, which had already gone beyond a critical point, having lasted 44 days. His doctor, family and friends had been deeply concerned about the catastrophic consequences if he continued, as his weight had fallen by over 16kg ( over 20 per cent of his original body weight ). The well known Bahraini activist Zainab al-Khawaja (who can been seen in the background) had also joined his hunger strike for the last nine days and has been with him every day since then, in a show of solidarity. She had traveled over from Denmark. Before she left Bahrain, she had been arrested and imprisoned many times by the authorities, and had attended protests on crutches after police deliberately fired a rubber bullet through one of her legs. Ali Mushaima is still determined to continue his campaign to save his 70 year old father, Hassan Mushaima, a political prisoner detained in dire conditions by the Bahraini dictatorship since 2011, and denied access to books, family visits and urgently needed medical care. When I talked with him ten days earlier he still retained his irrepressible good spirits, even while sitting in the rain on his makeshift pavement bed in front of London's Bahrain embassy. It was heartbreaking and yet in some way still inspiring to see a young Bahraini man determined to risk his own life to save his father, despite his obvious devotion to his wife and four month old daughter Zahra. They visit him every day. Ali's supporters have said that everyone is not just welcome, but also encouraged to visit Ali Mushaima ( twitter @AMushaima ). Bahrain claims that it is his father who has refused to attend medical appointments, but even its official statements admit that they refused to take him for scancer scans because he would not wear shackles on his legs. The British government has done nothing because the regime uses its oil wealth to buy our silence. When, a couple of weeks ago, Ali informed me that a hunger strike in solidarity with him to save his father had now started in a Bahrain prison, I agreed it was good news but I then asked "But doesn't that increase the pressure on you ?" and he responded politely but firmly, explaining that "some things are so important they are worth any sacrifice." Two days earlier he told journalists, with defiance and self confidence, that "my empty stomach is stronger than their (Bahrain's) weak and cowardly regime." Prior to his hunger strike he was fit and in good health and even in recent days I've seen him chatting with visitors, sometimes joking and at other times talking passionately about the human rights situation in Bahrain and the Gulf. However, the dark patches under his eyes betray the true difficulty he is facing, as he continues his hunger strike on the pavement opposite Bahrain's embassy. Ali sleeps on a makeshift bed on the pavement and has to make a long walk to Victoria Station every time he needs to use a toilet or take a wash. He is only asking the Bahrain authorities to provide his Dad with urgent medical treatment, a few books and to allow family visits which have been blocked since February 2017. About two weeks ago I happened to be with Ali when an angry Bahraini man approached him, accusing him and his father of wanting to "overthrow the government." Ali asked the man if he would like a seat, unfolding a portable chair for him. The man sat down reluctantly and Ali first explained that his father had only been asking for freedom of speech, but that his hunger strike wasn't even about that nor was it in support of any justifiable demand for more democracy. Rather, he was on hunger strike merely to obtain for his father the most basic of human rights, to which even the worst criminal should be allowed - the right of occasional family visits, proper medical care and books. The visitor's voice gradually quietened as he asked more questions, and after 30 minutes he finally left, promising that he would do what he could to help. Even such an initially ardent supporter of Bahrain's authoritarian regime could see that its treatment of Ali's elderly father was a complete violation of the man's most basic rights. However, the only notable response from the Bahraini Embassy has been several litres of a foamy liquid, poured on to Ali as he lay sleeping on the pavement. 3) Write to your MP, the Foreign Office or the Bahrain Embassy at 90. Belgrave Square. 4) Show your solidarity by visiting Ali Mushaima on the pavement in front of London's Bahrain embassy at 30 Belgrave Square.